Both car and wall plugs. Power banks are great, but only if you have them with you. 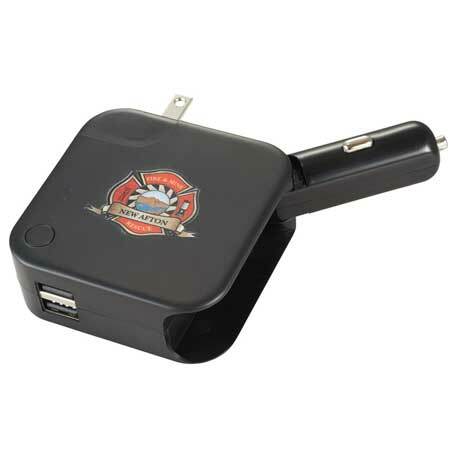 The Squall Charger and Power Bank is unique in that it is a power bank that can be charged with a built in wall plug, and built in car adapter. With a Squall Charger and Power Bank charging in the car or in the office, it is easy to be at hand when you need it. For marketing purposes the Squall Charger and Power Bank can be imprinted in full color at 1.25″ H x 1.50″ W. There are two USB ports for charging. Currently Squall Charger and Power Bank is only available in black. This is not the best looking charger out there, but it certainly is one of the most practical, and that means it will likely be used a lot, and get your marketing message seen at every usage. Please contact us at info@proformagreen.com if you would like more information on the Squall Charger and Power Bank.